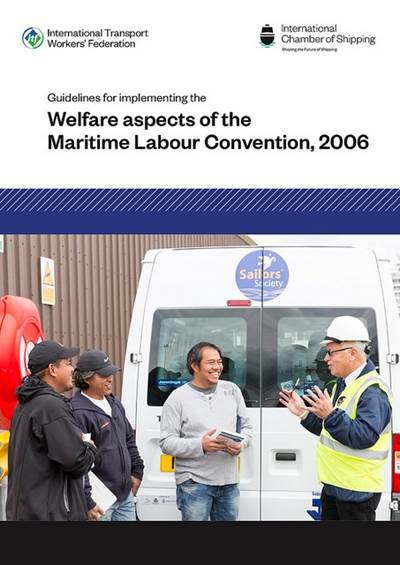 The International Chamber of Shipping (ICS) and the International Transport Workers’ Federation (ITF) have jointly released new ‘Guidelines for implementing the Welfare aspects of the Maritime Labor Convention (MLC)’. Adopted by the International Labor Organization in 2006, the MLC aims to ensure comprehensive worldwide protection and enforcement of the rights of seafarers, and to establish a level playing field for ILO Member States and shipowners committed to providing decent working and living conditions for seafarers. ICS and ITF emphasize that a number of countries with highly developed arrangements for providing seafarer welfare services and facilities are not yet signatories to the MLC, while many seafarer supply countries have also not yet developed welfare organisations to provide services or facilities for seafarers either at home or abroad. The new Guidelines, which can be downloaded from the ICS and ITF websites (free of charge), are currently being distributed throughout the global shipping industry via ICS national shipowners’ associations and ITF union affiliates. National governments and other parties with an interest in promoting the implementation of the welfare aspects of the MLC are strongly encouraged to take advantage of this complementary publication. As representatives of shipowners and seafarers respectively, ICS and ITF have previously teamed up to promote initiatives of mutual benefit. In 2016, both organisations joined forces to publish the international ‘Guidance on Eliminating Shipboard Harassment and Bullying’, which can also be downloaded from the ICS and ITF websites (free of charge).